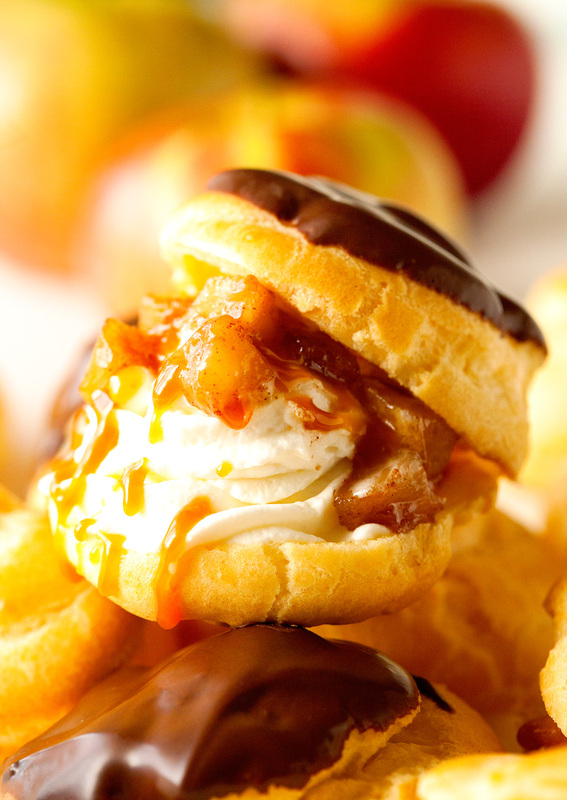 Profiteroles dunked in Chocolate and filled with classic fall flavors – Sweetened Apples, Salted Caramel Sauce and a Homemade Whipped Cream Filling. In order to keep the title somewhat manageable and short, I decided to go with Autumn’s delight as part of the name for this recipe. 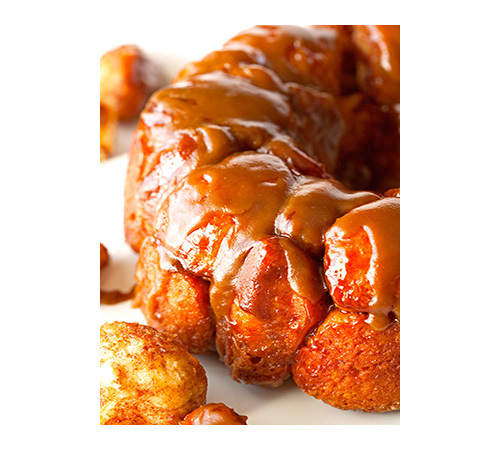 I think most people would agree that apples and caramel are fall’s most iconic combo. And because apples never tasted as good as they do right now, they are definitely starring in today’s post. 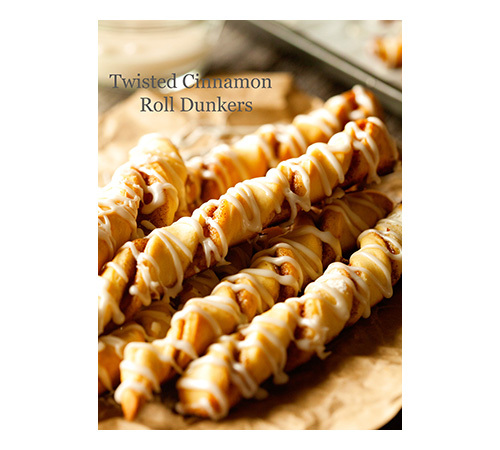 Nestled on top of a sweet whipped cream filling and drizzled with made from scratch salted caramel sauce, they are responsible for making all of the other components sing. La-la-la-la-la! 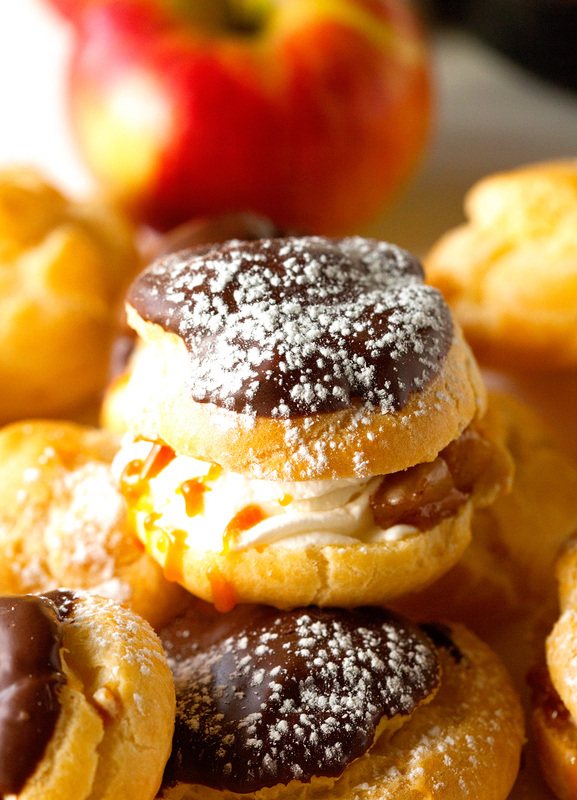 All this wonderfulness hides inside profiteroles or more commonly known as cream puffs. Light and delicate pastries that I never thought I could pull off. If you’re anything like me, I am here to tell you that there is nothing to worry about. EVRYONE will be able to master these. I gained confidence since learning how to make churros and having delicious success with them. The process of creating churros is quite similar to making pastry puffs. The only difference is the addition of eggs to the choux pastry (a light dough) and baking your sweet treats instead of frying them, which makes it even easier. Plus, you can pipe out the profiteroles ahead of time, freeze them and then just bake them off whenever you’re ready to go. 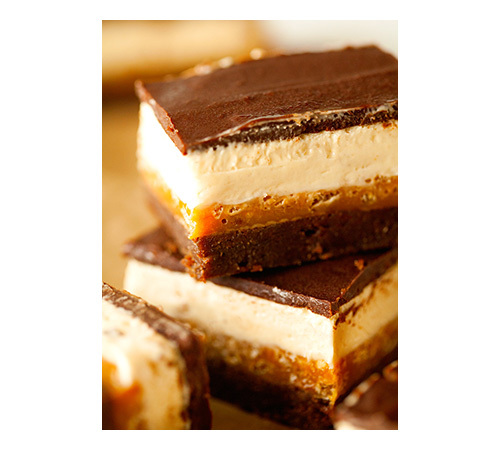 So if you’re looking for a dessert that’s sure to impress and comes together in no time, this one is it. 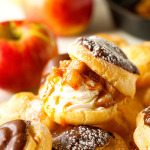 Before moving on, I should tell you that this choux pastry recipe is perfect for creating some other goodies as well. If you love éclairs or gougères, you can use this dough as well. I don’t think there’s anything lighter, airier, or perfectly crispy you can sink your teeth into. 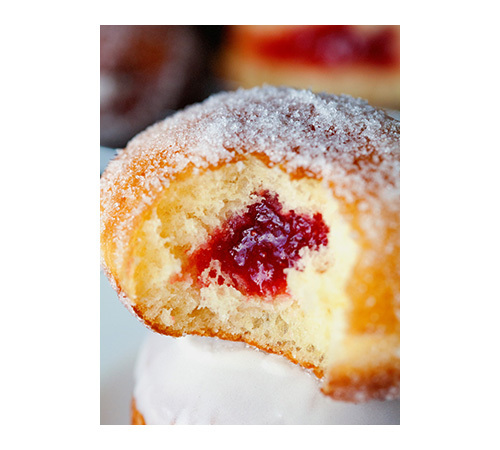 In fact, whichever pastry you choose to make will practically beg to be filled with something. 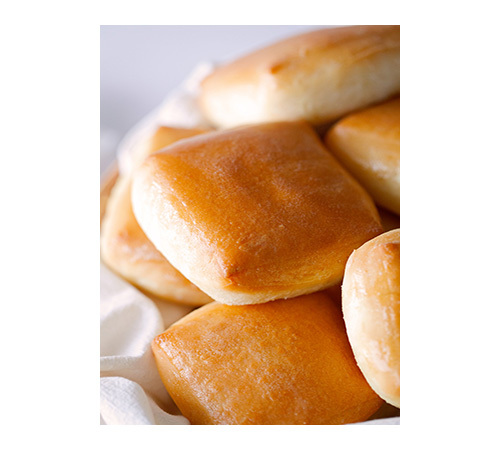 There’ll be plenty of air pockets and since the dough itself isn’t very sweet at all, you could even go the savory route. There are absolutely no limits as to what you can whip up! But, personally, I am totally smitten with what I chose to fill these profiteroles with. The sweetness of the whipped cream, coupled with the tartness of the spiced apples and the addition of that salty caramel sauce, is a dessert that satisfies almost all of your senses all at once. The best kind, if you ask me. Hope you’ll give these a try. Have a very happy Monday! My heart is skipping a beat at the sight of these. Just wait until you get to taste this easier than you might think dessert. 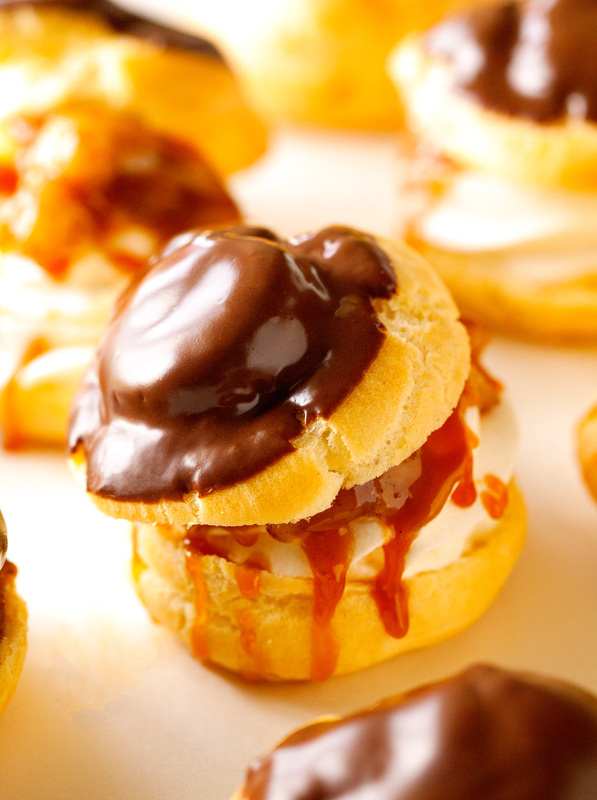 Your guests will be so impressed - you never have to tell them how easy it is to make profiteroles from scratch! 1. Preheat oven to 400 degrees F. Line a baking sheet with parchment paper. You can fit a pastry or large ziptop bag with a 12-inch tip or simply cut off one corner of the bag once it's filled with the dough (that's what I did). 2. Whisk together the flour and salt. Set aside. In a medium saucepan, combine water and butter and bring to a boil. 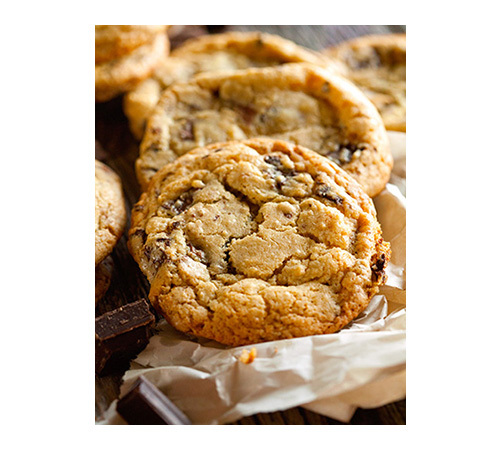 Before adding the flour mixture, make sure that the butter is completely melted. Using a wooden spoon, stir in flour mixture into the wet ingredients on the stove and beat vigorously until fully incorporated and no lumps remain. The dough is ready when it starts to pull away from the sides of the pan and begins to form a ball. Remove from the stove and let cool for 5 minutes. 3. Stir in one egg at a time (making sure to fully incorporate each egg before adding the next one). Your final dough should be smooth and glossy. Spoon into the pastry or ziptop bag and cut off one corner. 4. Pipe desired shapes onto the prepared baking sheet, spacing them about 2 inches apart. I started piping a 2-3-inch circle onto the baking sheet and topped that with 2 smaller circles. It should remind you of a raised snail shell and doesn't have to be perfect. 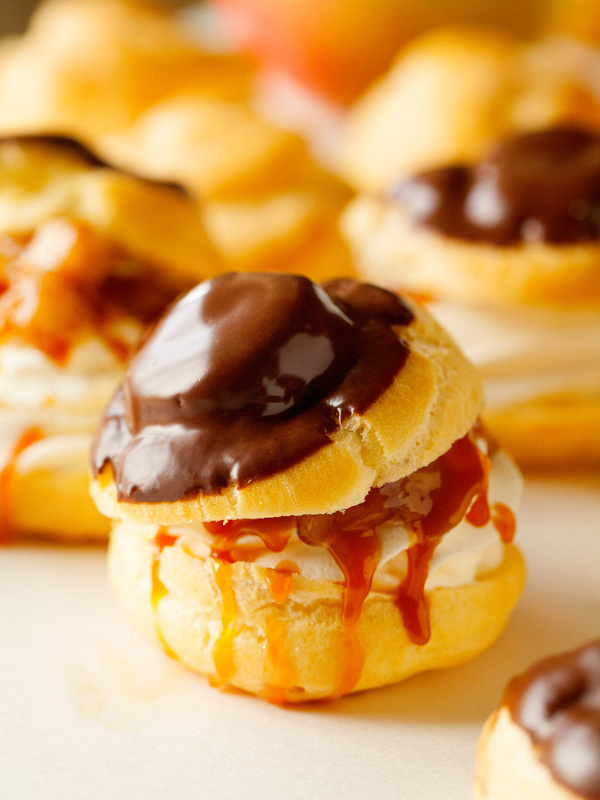 Once your done piping out your profiteroles, wet one of your fingers and push down any pointy parts in the middle of each profiterole (as they tend to burn quickly). Optional: At this point you can put the baking sheet into the freezer (for at least 1 hour or until profiteroles are firm), transfer them to a freezer bag and pull them out when you're ready to bake them. Proceed as directed. No need to defrost them first. Place in the oven and bake for 10 minutes. Increase the heat to 425 degrees F and bake for another 10-15 minutes or until profiteroles are nice and golden. Remove from the oven, transfer to a cooling rack. 5. While the profiteroles are cooling, prepare the chocolate glaze by combining the chocolate and oil in a microwave-safe bowl. Heat in 30 second intervals, stirring often, until chocolate is completely melted. Dip each profiterole into the chocolate and return to wire racks until chocolate is set. 6. While chocolate is setting, prepare the whipped cream filling. In a medium bowl, whip heavy cream until soft peaks form. Add confectioners' sugar and whip until stiff peaks form. Place in the fridge while you cook the apple topping. 7. Peel and dice the two apples. Places the apples along with all of the other ingredients (except for the caramel sauce and confectioner's sugar) into a skillet. Cook apples over medium-high heat until they're tender,soft and caramelized, about 5-8 minutes. Remove from the stove. 8. Cut the profiteroles in half. You can either spoon or pipe desired amount of the whipped cream topping onto the bottom half of each profiterole (I used a piping bag and star tip to pipe on mine). Top with a heaping tablespoon of the spiced apple topping and drizzle with salted caramel sauce (I had my homemade caramel sauce in the fridge). Place second half on top. 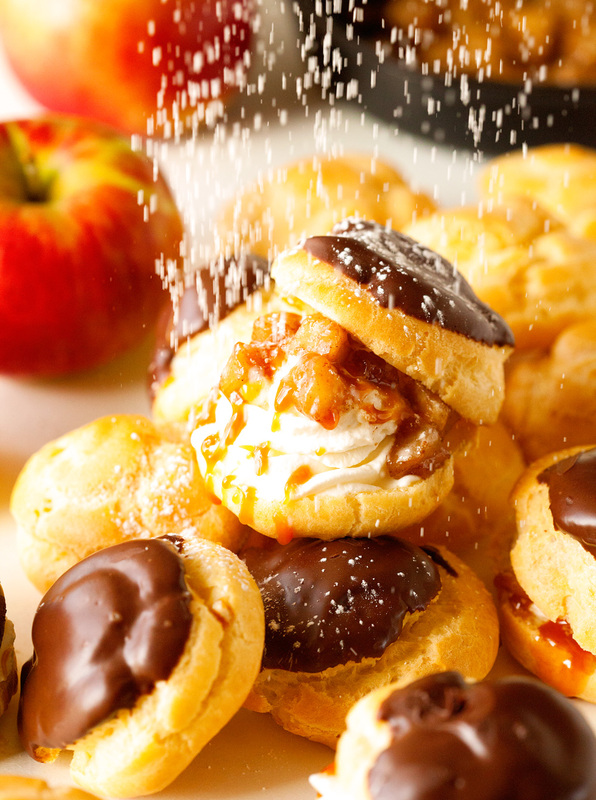 Sift confectioners' sugar over the top of each profiterole and serve, 2-3 per person. Filled profiteroles are best enjoyed immediately. 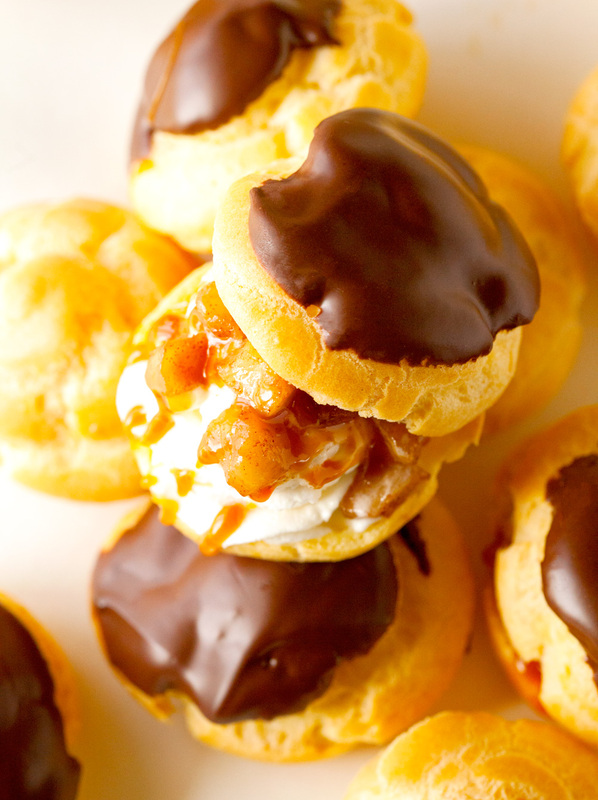 Frozen, unbaked profiteroles can be stored in the freezer for up to 7 days. To cut down on time, you could use store-bought whipped cream topping and caramel sauce instead. 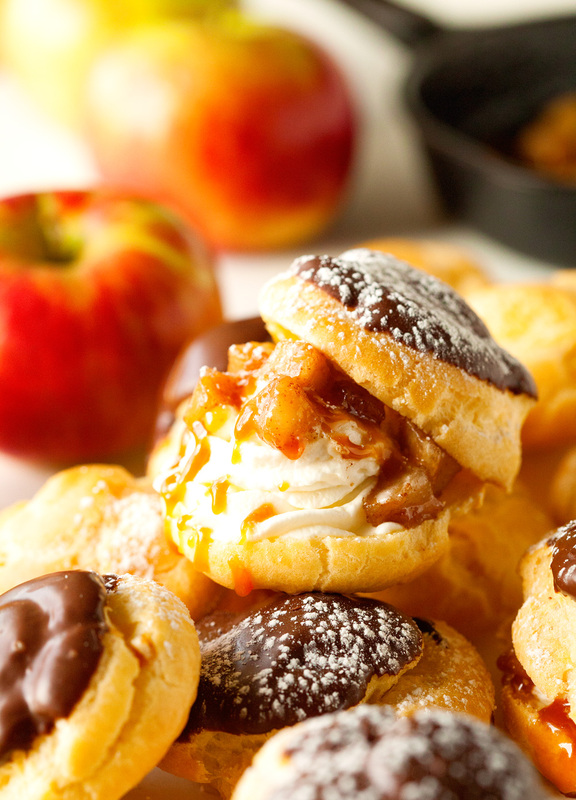 Apples and caramel are definitely the perfect flavors for fall! I love that you combined them in these profiteroles, Kathi! Looks incredible! Wow! 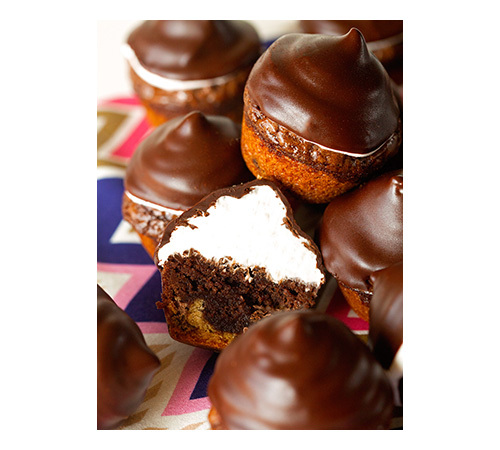 These look like heavenly clouds of chocolate pastry goodness! Gorgeous photos! They definitely are! 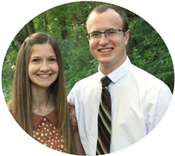 Thank you so much, Jess! Love profiteroles!! And I love that you used apples, my current favorite fruit until the pears coming roaring in! Totally! I can’t wait for pears too! Thank you so much, Nicole! Still obsessed with your creations, Kathi. And this one is absolutely heart-stopping. I just know the fambam would love it!! You are so sweet, Ala. Thank you so much for the love. Wish I could share them with you! Kathi, I just can’t with these! You’ve outdone yourself. 🙂 I’ve been a scaredy cat when it comes to making pastries like these at home, but I’m glad to know I should face my fears! 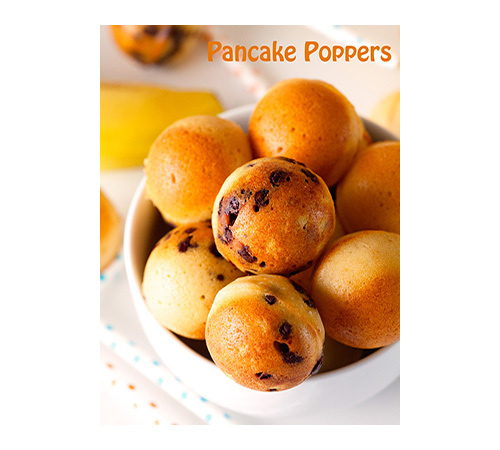 I love all of the flavors you’ve included in these, and you can’t go wrong with chocolate-dipped anything I think! I used to be too. Once you give it a go, you won’t be able to stop ;). Chocolate-dipped was a must ;). Thank you so much, Alyssa!